Saints were without both Toby and Morgan, arguably our best players this season. Tadić passed a late fitness test and played alongside Long and Mané behind Pellè. Davis dropped in beside Victor. Whether due to injuries to defenders or fear of our fullbacks breaking forwards, United opted for a back three and five across the middle with Valencia and Young as 'wingbacks'. The TV cameras may have hoped to see Ron put the nut on LvG but there was only a curt handshake. The early stages saw Big Victor putting himself about. Saints fashioned the first chance on 4 minutes when Long out-jumped Young at the back post but headed over. Saints seemed to be dominating an untidy midfield battle. On 10 minutes Long outstripped Young on the right but his cross was claimed by De Gea. Two minutes later Saints lost possession and United worked the ball to Rooney on the left. His forward pass was intercepted by Fonte but our captain passed back without looking. Van Persie accepted the gift, tucking the ball between Forster’s legs. It was their first attempt - 1-0 United. On 14 minutes Mané forced a corner from Carrick. Pellè rose at the near post but headed wide. Moments later Smalling competed with Long and the defender pulled up. As play moved away he was left prostrate on the ground and United wasted no time in bringing Jonny Evans off the bench to replace him. Both sides were guilty of poor passing. A forward pass sailed beyond RvP to be claimed by Forster: then Mané hit a dreadful cross wide of the front post! On 21 minutes Rooney fed Young on the left but his curling cross was headed cleat by Yoshida. On 25 McNair was robbed and Mané went on a weaving run into the box – then fell over. A minute later a lovely Pellè flick found Tadić. With Long breaking into the box Dusan hit his pass straight to De Gea. Tadić’s next contribution was better – setting up Pellè who forced a save from De Gea. Saints were beginning to dominate midfield but too many promising moves faltered in the final third. Then, on 31 minutes, the luck turned our way. Davis carried the ball deep into United’s half. He was tackled but the ball ran to Long on the right. His cross found Tadić at the back post. He got a shot away. It was partially blocked but Pellè was the first to react and swept the ball home off the bar. 1-1. Two minutes later Big Victor fouled RvP but Forster easily claimed Mata’s free kick. Then Tadić and Clyne worked the ball down the right. The ball was crossed for Mané but, in attempting to clear, McNair hacked the ball to Long who should have done more than fire over. On 36 minutes Fellaini out-jumped Bertrand at the back post but his downward header was hacked clear. United were getting away with plenty. A clear push on Mané went unpunished – not for the first time. On 39 minutes United replaced McNair, bringing on Herrera and dropping Carrick in alongside Evans and Rojo. 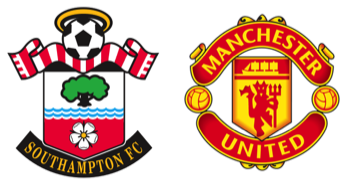 Saints pressing game continued to cause United problems, one block tackle by Clyne on the edge of their penalty area saw the ball go out for a goal kick. Before half-time a Young cross drifted harmlessly out. Then at the other end, Valencia challenged Mané for a cross and the ball dropped to De Gea. Saints won and wasted another corner, before Pellè’s mishit shot nearly ran kindly for Long. In the final seconds of the half, RvP who’d only had one decent pass (from Fonte) took the ball along the edge of Saints box before curling a shot against the side netting. Half time: 1-1. No further changes in personnel for the 2nd half. In the first attacking move of the half Clyne was fouled allowing a free kick to be played into their box. Maya collected it and played the ball out off Evans. Friend says goal kick FFS! Saints continued to press and on 52 minutes a left wing cross arrived at the back post but Long hit his header straight at De Gea. United gradually began to string passes together and Young was able to deliver crosses from the left but Saints headed them away. Approaching the hour mark the game became end-to-end but, again, the best chance fell to Saints. Tadić dispossessed Rojo and fed Pellè, but the centre forward’s shot cleared the bar. On 62 minutes Mané made his best contribution of the night with a peach of his cross. Long jumped to meet it but Young did enough to prevent a clear header. Another foul on Pellè went unpunished before, on 65 minutes, Saints finally won a free-kick and the home fans cheered loudly. United had a period of pressure ending with a free kick on the left. At this moment Saints replaced Tadić with Jake Hesketh, making his debut. Rooney swung over a deep cross but Saints conspired to allow both Fellaini and RvP unfettered runs at the back post. The latter toe-ended the ball between Forster’s legs to put United back in front. 2-1 United. Initially Hesketh looked lively, but seemed to fade as the game drew to a close. On 76 Mané fed Pellè and his cross-shot was turned away by De Gea and the corner was wasted. On 79 Mayuka replaced Long but made little impact. On 83 Fellaini grabbed the ball expecting a free kick, but instead was penalised for handling. Davis’s free kick was cleared and then Clyne’s deep cross was comfortably collected by De Gea. Then Evans gave away a corner. Davis took it and the ball was fed to Clyne who fired just wide of the post. Bertrand was next to shoot, winning a corner which United headed away. The final whistle saw another handshake between the Dutch managers as United clocked their 5th consecutive league win. You can‘t help but be impressed by a team that can be so completely outclassed for most of the match, yet go home with all the points. Nothing suggests Saints aren’t a good team but United don’t need to be – they have good individuals. De Gea looks a really classy keeper and, if not already, will become world class before long. Van Persie has been world class and on tonight’s performance still looks it. His personal stats (3 attempts, 2 goals) are all United managed all night yet that was enough to beat Saints. On another day it might be Mata, Rooney or someone else who wins matches for United. The point is, teams that can afford this quality of player can turn in poor team performances yet come away with unlikely wins. The 'Southampton Way' does not allow for the recruitment of mature professionals at the top of their game. That, in reality, sets a limit on what our club might achieve.